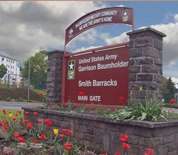 US Army Garrison Baumholder is located in Rheinland-Pfalz, Germany. The installation is conveniently located within a few hours' drive of France, Belgium, Luxembourg, Holland, Austria, Switzerland and the Bavarian Alps. The base consists of three separate locations located in the city of Baumholder, Idar-Oberstein and Neubruecke. The garrison is home to the largest concentration of combat soldiers outside the US. The mission on base is to support German-American relations by engaging in force protection, deployment support and installation support operations. The 1st Armored Division serves as the major command at Baumholder. Additional units include the 102nd Signal Battalion, 16th Sustainment Brigade, 30th Medical Command and the 405th Army Field Support Brigade. This USAG Baumholder directory features the critical info you’ll need to navigate through the many facilities and recreational opportunities available on base.